Keeping Emergency Survival Kits at school for students and administrators is an essential part of maintaining a safe school. But don't waste your time and money constantly replacing unreliable store-bought items when you can get a kit designed by emergency preparedness experts to last and be ready when you need it. The 1-Person Basic ER™ Survival Kit provides both piece-of-mind and safety at school. It contains a 72-hour survival supply for 1 person including US Coast Guard Approved 5-year shelf-life food and water. Many people don't realize that store-bought items such as canned food and bottled water don't store safely for longer than 6 months; and even less when exposed to extreme temperatures. And, the last thing you want on your hands are sick kids following a disaster. Following a catastrophic disaster during school hours, students and school administrators may be stranded on campus for days to weeks until roads are cleared for safe driving. And, if the school building suffers structural damage, students may be forced to shelter outdoors and endure the elements. Electricity may be out for weeks leaving everyone in the dark and causing water treatment plants to stop working. There may also be injuries requiring medical attention when no emergency assistance will be available. Not only do you want to keep your students to be safe, but also it is your responsibility to take measures to protect your students from forgeable dangers such as natural disasters. Failure to maintain standards of protection opens administrators up to liability if losses or injuries occur because of their failure to act. 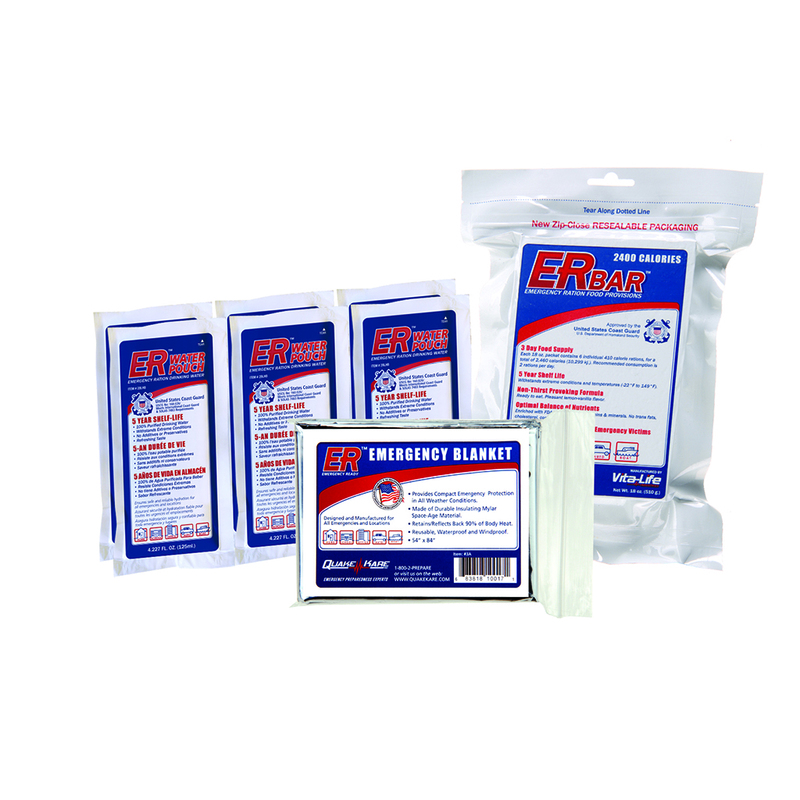 School ER™ Survival Kits are designed to contain everything students and administrators need to survive for 3 days when confronted with an emergency disaster situation at school. Being prepared ahead of time is the best insurance plan you can have to protect ourselves, our children, and our coworkers should a disaster strike. Don't delay, prepare today! A 1-person, 72-hour survival kit packaged in a gallon size zip-lock bag. This basic survival kit contains supplies to ensure students, teachers or office workers have food, water and shelter following an unexpected disaster. The kit includes a 72-hour supply of food and water and a thermal emergency blanket for warmth or shelter.